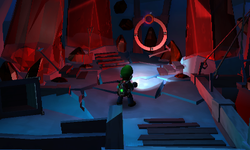 The Crystal Quarry is a room in the Secret Mine in Luigi's Mansion: Dark Moon. This room is in accessed by taking the northeast door inside of the Deep Hall. The Crystal Quarry is a room that was once used as an area to mine for red crystals. There are many minecarts scattered around the room. There are a few shovels and pickaxes and a mining shaft carrying red crystals. In the middle of the room is an E-Gate and three large crystals. During Hit Rock Bottom, Luigi must investigate the Crystal Quarry due to a Toad assistant bringing back a suspicious photograph. Before Luigi can enter the Quarry, he can investigate a hole in the wall to see three Boos laughing at a Sneaker, a Slammer, and a Greenie trapped inside of crystals. Once Luigi enters the room, the ghosts transform into a Strong Sneaker, a Strong Slammer, and Strong Greenie. If Luigi investigates one of the crystals, Luigi has to fight the ghost in said crystal. After defeating one ghosts, the other two break out from their crystals. Once these other two ghosts have been defeated, the mission ends. In Across the Chasm, and other missions after, the crystals remain shattered, but the E-Gate is now usable. Only during Across the Chasm and Severe Infestation, Luigi can enter the E-Gate inside of the Crystal Quarry to drop onto the couch inside of the Chalet to release a sapphire. This page was last edited on September 19, 2017, at 02:49.